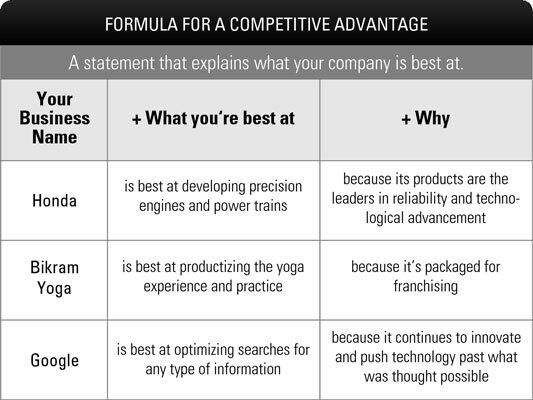 You should be able to state your competitive advantage succinctly, both in your strategic plan and when talking to others about your business. Learning from others can be helpful in identifying your own competitive advantage. Check out the following two examples to see how these organizations define their uniqueness. Pershing General Hospital is a 125-bed, primary-care facility located in a rural area with no other hospitals within 50 miles. Because the organization operates with almost zero competition, it doesn’t need to focus on how to beat out other hospitals. However, it does need to decide what services to offer with its limited governmental funding. You should be able to answer what your company is best at in 30 seconds. Look at figure and use the formula (your business name + what you’re best at + why) to put your list of unique activities into a succinct statement or bulleted points.